Yahoo today unveiled new look and features to itâ€™s search results page, mail and messenger products. The announcement follows the launch of new Yahoo home page last month. The user interface changes to Yahoo search results pages are similar to the new yahoo home page design with a few tweaks like a left column to refine the search results. 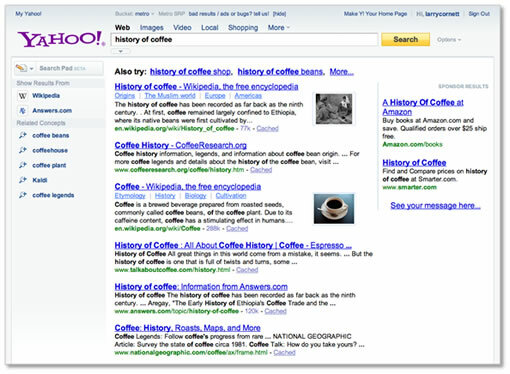 Yahoo says, the new search design makes search more personal and relevant and helps people explore things that matter most to them. The main change is the left column added to the search results page, using which users can filter the search results and have quick access to the search-specific applications. For example if you are searching for people using the left column links you can narrow your search to twitter, Facebook etc, and if you searching for how to articles, it will display eHow, YouTube links using which you can refine the search results according to your needs. The search pad, a note taking application launched recently is also moved to the top of the left column for quick access. In addition the searchscan and safe search features are also integrated to the left column. There are also some improvements to the search assistance feature as well. These changes are not yet available to all the users, only a small percentage of people in the US are chosen at random to test these changes. Will these changes make people to switch from Google, it is unlikely because most of the features announces are just enhancements to the user interface. 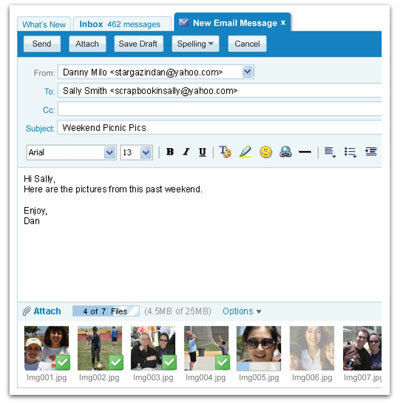 Yahoo Mail has a new interface for quite some time for some selected users that includes social apps like Flickr, xoopit myphotos, today they are releasing these features all Yahoo Mail users. Along with the previously released apps they are adding new apps from next month including an app from Evite for planning events and parties. With the new attachment feature, users will be able to drag and drop photos to emails, upload multiple attachments and folders at once. â€œYou will also be able to view thumbnails and rotate your photo attachments before sending them to your friends and family.â€ Check out the full details here. 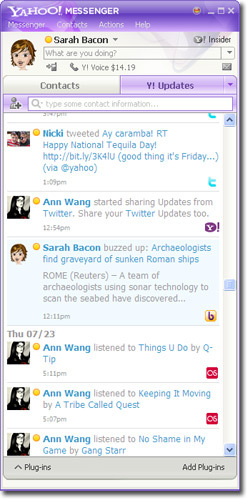 Yahoo messenger 10 beta is now available with some new features. According to Yahoo they completely redesigned the webcam feature, now users can make high-quality video calls with synched audio right in the IM Windows. â€œFeatures include the ability to swap video windows, position the video windows side-by-side, mute the call or place it on hold. You can even go full-screen with your video call. To get started, click the new â€œVideo Callâ€ button in the IM window.â€, Yahoo says. They have enhanced the contact list view, now they display contact list updates like their messenger status, their twitter messages if they opt-in to display and other social stream like last.fm listening list etc. New language preferences allow you to change the language anytime, during signin you can select a different language than the version you are running, menus and buttons will change to that language. You can select from 16 different languages. 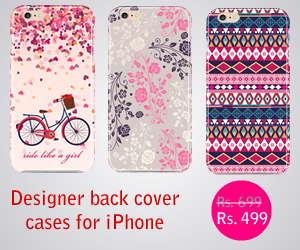 Check out the full details here. Just like in the regular contact list view, you can easily IM a friend, start a video call and more, right from the Yahoo! Updates view. Or use the contact action bar to quickly find a friend without switching tabs. We also added additional features for how and when you see your friendsâ€™ updates. When a new update comes in, a â€œtoastâ€ alert will pop up in the lower right corner of your screen. If you want to disable these, go to Messenger > Preferences > Yahoo! Updates. You can turn alerts on and off and even update preferences by contact or by type of update. I CANNOT OPEN ANY VIDEO OR OTHER ATTACHMENTS EXCEPT WORD AND EXCEL. IS THERE SOMETHING NEW THAT I SHOULD HAVE DOWNLOADED OR SHOULD HAVE BEEN INCLUDED? IF I CAN NO LONGER OPEN ATTACHMENTS FROM FRIENDS, THE NEW VERSION OF YAHOO STINKS.